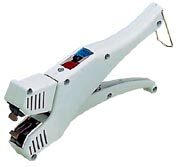 Dual heat multi-purpose hand held constant 1/2 " x 1/4 " spot heat sealer. Ideal for sealing clam shells to prevent pilferage. Supplied with a high and low temperature control switch with power light and proportional temperature control system. To spot seal OPS, PSP, PVC, and EPS food containers.